To collect this pet, players must travel to the Stonedark Grotto cave in Highmountain, and participate in the snail race inside. There are no prerequisites or quests necessary. 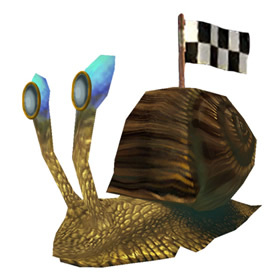 Every few minutes a snail race will occur, and players must help Zoom win the race by interfering with the competitor snails' progress. To do this, players need to stand in the way or walk into the other snails. Blocking them kicks up a cloud of dust around the competitors and ideally causes them to turn left or right in an attempt to go around you. Be careful not to accidentally block Zoom! Players are immediately awarded Zoom once the achievement has been completed. The next round the user charges the enemy with unstoppable force, dealing 985 Critter damage. You can't use Super Sticky Goo and Slow and Steady in the same battle. At level 25, Zoom's speed value during Charge is 1580. It's consistent with the general formula S+50*lvl*qty, where S is the current speed – and as you can see during the battle or via BPBID hints, S = -45. Zoom is currently the only pet that has the Slow and Steady ability. If you hit an undead pet with Super Sticky Goo, followed by Slow and Steady, it will do 1387 damage (crits for 2081). Zoom has a huge health pool of 1969, but his speed is 0, so he will always move last, unless of course, he uses Charge ... which always goes first. Agree with piece of cake, as well as using Fragment of Desire. I got there when the race was already 3/4 done and still was able to make Zoom win. Got the achieve and the pet showed up in my pet tab immediatley after Zoom crossed the finish line. I think Blizz made the race easier since launch. I remember trying it in the early weeks of Legion and thinking it was impossible, but went back and did it after 7.1 and it was a piece of cake. I didn't use any toys or tricks, but I did use walk mode which made it feel less clunky. Good luck! was impossible, until I used Fragment of Desire. This is what I did and then it was EASY zoom won by OVER half the race ahead. Do walk mode, its a better speed to be right amount in front of the snails. Seems like Blizzard has hotfixed the multiplying Zoom function. NVM...I just found 2 more in my pet log this morning after caging 2 the night before last and then caging 2 again last night. Now I have like 8 Zooms. I did it with back-pedalling and my Fragment of Desire. I didn't have the toys other people have suggested, but I did have my pets. I was very happy to see Zoom's opponents get oh so confused from the moment they began to race with this pet near them (not Zoom!). From there, I angled my camera so I was looking down on them. Luckily, due to Fragment of Desire's confusion, the three ended up in a ball easy to stay on top of, quite literally. When they moved anyway, I back-pedalled. GL! If you have a fragment of desire, take her out while you do this with gamon's braid/Vykrul horn. She'll confuse the lot of them - the first time she might get zoom, but the second time he should be far enough ahead to just get the competetors, which will help assure his victory. If you use Vrykul Horn or Gamon's Braid, it will make you bigger and make it easier to stand on the snails. Also, make sure you are right on top of them! Took me three tries, but soloed with all the advice already given...walk, don't run, and I used a growth potion (not sure if it did anything but I had it so used it). Zoom just keeps on multiplying. I have 6 so far and everday I seem to have more. Is this a glitch or is the little guy just going to keep bringing his friends around. Still a cute pet and you can solo getting him. This worked on second attempt. 5. When you see the effect around them, that means they're slowed, again, zoom can't get this. Don't worry about standing on him. After I did the achievement, 3 showed up in my journal. I assume this is a bug, but who knows. So, got Zoom and then the next day i had three of them. I was able to cage the two extra, the them on the ah, and the next day another two showed up in my journal..
Easy to get and worth it. He's a little cutie. A critter with a charge up ability? This one will be interesting to use. He may not be the fastest snail, but he has the heart of a champion.